Mochovce power plant is located in western Slovakia, in central Europe. An auxiliary building will be constructed on the site for units three and four. The turbine section at unit four of the Mochovce power plant. Construction at the turbine hall of unit four as of July 2012. The construction of unit three is expected to be completed in 2012. The reactor pressure vessel of unit four was installed in December 2011. Mochovce nuclear power plant is a 1,760MW nuclear power plant located between the towns of Nitra and Levice in the region of western Slovakia. Operational since 1998, it is one of the oldest nuclear construction projects within Europe. Construction of units one and two of the Mochovce nuclear power plant started in November 1982. Construction on units three and four was commenced in 1987. Construction had to be halted in 1991 due to unavailability of funds. Later in 1995, the state government approved the plan to complete the first two units. The two units were commissioned in 1998 and 1999. Construction of units three and four was resumed in 2008. They are expected to be commissioned by 2012 and 2013 respectively. Commercial operation is expected to begin in 2013 with an operational life of 40 years. The first two operational units of the plant generate 6,000GWh of electricity, which fulfils about 20% of the state’s energy needs while cutting five million tons of CO2 emissions each year. Slovenske elektrarne, a state-owned company, is the owner and operator of the plant. The power plant is equipped with four VVER-440/V-213 rectors. All the units are water cooled and water moderated energy reactors. The water-cooled units three and four are comprised of an auxiliary nuclear building, fuel pool, control system cabinets and steam generator. The four reactors will serve about 45% of the state’s electricity demand, once operational. The VVER 440/V-213 rectors were designed and developed in the Soviet Union. The pressurised water reactors are fuelled by uranium. The upgraded model of VVER-440, the V-213 has enhanced nuclear safety standards. It features emergency core cooling, auxiliary feed water systems and accident localisation systems. The Nuclear Regulatory Authority (NRA) of Slovakia approved the strategic preservation, maintenance and protection plan of units three and four in 2000. Slovenske elektrarne completed the feasibility study and unveiled its decision to construct the two additional units in 2007. In 2008, NRA approved the design of the units paving way for resuming the construction. An environmental impact assessment (EIA) of the project was processed in 2009 and the final approval was issued on 30 April 2010. The reactor pressure vessels of the units three and four were installed in September 2010 and December 2011 respectively. 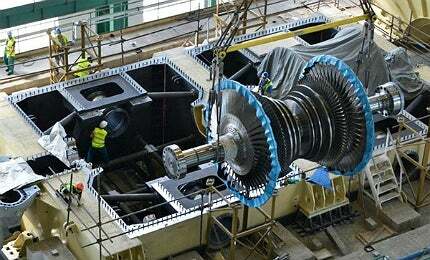 In December 2011, the first turbine was also installed at unit three. In June 2009, Slovenske elektrarne awarded the main contracts for units three and four to a consortium led by Skoda JS, which included Atom Stroy Export (ASE) and three Slovakian suppliers namely (Výskumný Ústav Jadrovej Energetiky (VÚJE), Enseco and Inžinierske Stavby Košice). The engineering, construction and project management contract was awarded to Enel Ingegneria & Innovazione, a company based in Italy. Siemens and Skoda Power will supply the instrumentation and control systems (I&C), and steam turbines for the plant. Arako, a Czech company, will supply components worth $26m for the plant. Rolls-Royce Group will supply its Spinline™ neutron instrumentation system for units three and four. AMEC, an international engineering and project management company, will supply decontamination and remotely operated equipment for the power plant, under a subcontract with Skoda JS. Nexans will supply 5,000km of low-voltage (LV) power, control and instrumentation cables worth more than $26m for the new units of the nuclear power plant. Slovenske elektrarne has invested $844m in the first two units. Enel Group purchased 66% stake in Slovenske elektrarne in October 2004. In 2007, the group agreed to invest $2.6bn for the completion and operation of the units three and four. The Belene Nuclear Power Plant project is located around 7.5km from the border of Romania and near the Danube River, in the Republic of Bulgaria. The Brunsbüttel Nuclear Power Plant (NPP) is located on the west coast of the Dithmarschen area of Schleswig-Holstein on the banks of the Lower Elbe, 3km east of Brunsbüttel. Construction of the Finnish Olkiluoto 3 1,600MWe nuclear power plant reached a milestone on 22 June 2010, after the installation of the reactor pressure vessel in the reactor building. Europe’s nuclear stress tests: genuine safety accounts or political charade? Stress tests conducted at European nuclear plants have found little wrong, but has enough been done post-Fukushima?